In 2005 the Doctor changed. For Doctor Who‘s new audience this meant little to nothing, while for a likely majority of the old series’ fans the casting of Christopher Eccleston merely meant the continuation of what had always been – the inexorable restoration and reinvention of the series’ lead character. And yet, even a year on, there were fans who clearly saw the seeds of this bold, new direction for Doctor Who and its hero in the brief TV tenure and its extended multimedia afterlife of the Eighth Doctor. It’s not a bad achievement, really. Consider how the series and Doctor might have been interpreted had it lived on as novels and comic strips only after Spearhead from Space [no Master, no name Gallifrey, no Sontarans, no Sarah Jane] or Robot [no Davros, Leela, K9, Romanas or Hinchcliffe/Holmes or Williams/Adams eras ], let alone The Twin Dilemma or Time and the Rani in their respective portrayals of the Doctor. Doctor Who the TV Movie may in its eighty-nine minutes say little new about the series beyond a hastily papered-over half-human parentage and a squirmed-at Doctor-companion kiss, but few would argue that its version of the Doctor, and particularly its choice of leading man, was absolutely perfect. This perhaps ought to be surprising; Doctor Who the TV movie is itself the product of mixed parentage, being a US production with UK and US names behind it. 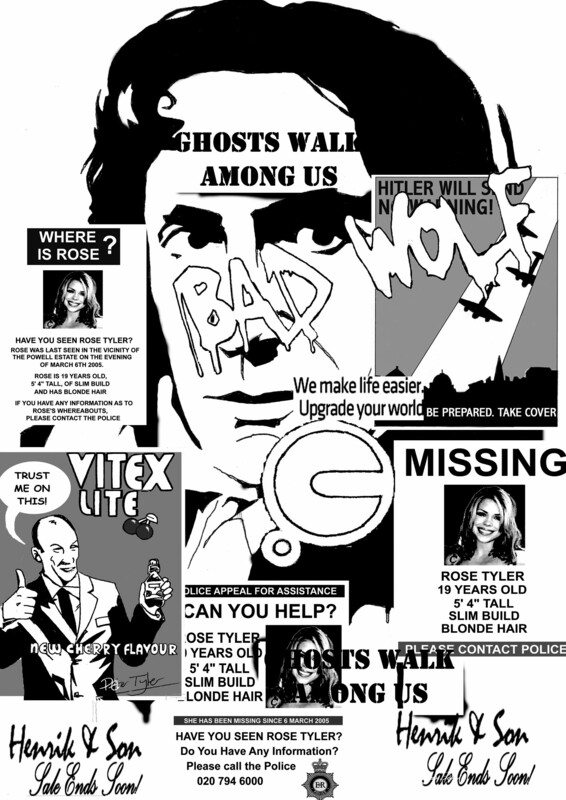 Its pitch at the renegade Time Lord is the closest the series had come to casting the Doctor as an Englishman Abroad – novelty factor included, Remington Steele in a TARDIS. Add to that the Doctor’s own ensemble being a collision of sartorial nods to archetypes from both countries [the Byronic antihero, the Wild West gunslinger] and the resulting impact and the longevity of its half-life is quite remarkable. 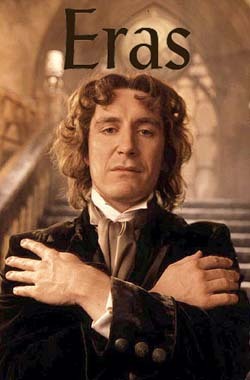 The Eighth Doctor was, more than any other incarnation, designed and extended by committee. Beyond the TV Movie the fan writers who took up the baton for the most part (some older hands – Dicks and Peel, excepted) invested a lot of their impressions of Paul McGann’s Doctor, rather than his predecessors, into their continuations; and so we know that in preparing their BBC Book Vampire Science Jon Blum and Kate Orman watched as many McGann films and programmes as they could to retain his mannerisms in their prose, while in Endgame on Alan Barnes seeded his comic strip Eighth Doctor with nods to the likes of Withnail & I. The success of the TV Movie in the UK is well enough known (it wasn’t actually a flop in the US, either, it simply wasn’t the remarkable success needed to become a series), but it’s as much a sign of good faith in Paul McGann’s role in the movie that his caretaker creators from 1996 to 2005 took great pains to keep his interpretation of the Doctor intact. And yet, 2005 is not where the Eighth Doctor’s story ends; the Eighth Doctor’s story is still being written. We know that it does of course have an end somewhere, and that this may involve the Time War. Thanks to Big Finish and the continued involvement of Paul McGann himself we have an audio and visual acknowledgement of the Eighth Doctor’s evolution leading up to that catastrophe, the stripping away of his carefree, Romantic exterior to reveal a more desperate, death-haunted loner – perhaps an early indicator of the Ninth incarnation to come. And there’s more to tell and not be told, because the Eighth Doctor is still a largely unfilled page, available to be read and added to by new custodian creators while his legacy, the revived series, forges on. “Humans,” the Doctor explains, are “always seeing patterns in things that aren’t there.” And so it is that the vivid impression cast by Paul McGann and his co-creators have allowed the ‘not there’ post-TV Movie life of the Eighth Doctor to continue, faithful indeed to the pattern set by eighty-nine miraculous minutes broadcast in 1996. …We can finally play this video. Woo! Yeah. Well, here’s the thing. Right about now we did have plans to upload yet another enlightening video from the new generation of Doctor Who enthusiasts (are supposed to call them ‘enth-Who-viasts’ now? 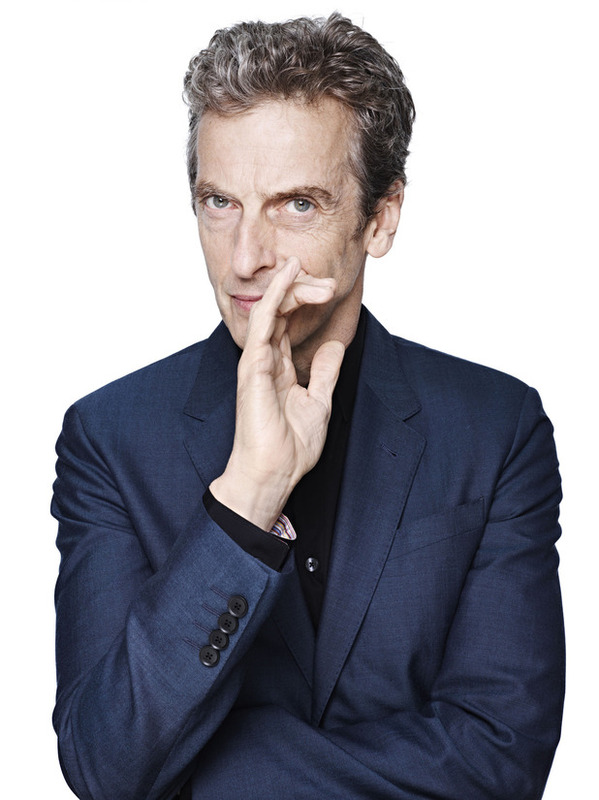 Search me) explaining the issue around Peter Capaldi’s casting and the dilemma it presents to what the series is supposed to be about – an exotic stranger who whisks viewer identification figures (i.e. age twenty-ish Western women) away for a romantic life in time and also space. It was a great video, possibly for some good reasons, but now we can’t upload it at all because wouldn’t you know it? said fangirl set the video to private shortly afterwards. And it could have explained So Much, as well. Boo! 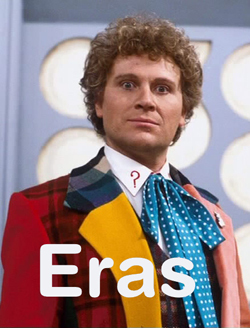 Or “erased from Doctor Who! !“, if you will. Last month in a breathtaking change from Stuff’s breathless coverage of PeterJacksondirectingWho!, the NZ Herald did some journalism ran an online poll asking readers who their favourite incarnation of the Doctor is/was (if you’re old). They even had an accompanying Photoshop filterisation of various publicity photos graphic for the textually-challenged, too. 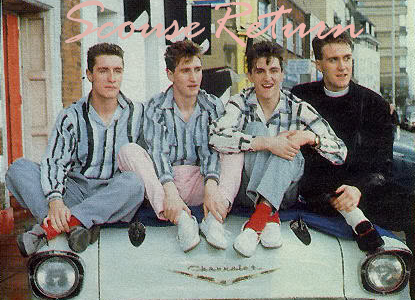 And of course, being a scientific survey, the resulting data omits Old Sixie from its Top Doctors score sheet. True, he fared an intergalactic ‘Nil Points’ in Eurovision style, but dammit Zero is still a score, you heartless sods!! The Missing Episodes thread is up to its twenty-fourth part now on Outpost Gallifrey, doggedly lumbering on like a Who-storical internet series in the face of disavowals and denials from the Beeb and episode hunters and restorers alike. Every week, the same faces, the same names, the same parsing of official statements and the same mad theories. We read this stuff so you don’t have to, you know. The Lake of Mutations? A Force for Good? It may be closer than you think. Recently prime time identity-challenged social media affairs infotainment show Seven Sharp ran a story on Taupo’s Raoul Lealand, a man who, inspired by childhood memories and the chance find of a distinctive vacuum clearer part went and made his own operating Dalek , complete with water pistol and Cushing-styled dry powder fire extinguisher blaster functions. Uncynical, matter-of-fact, respectful and generous in its airtime to the charitable gentleman himself, this article tickled our ribs, warmed our hearts and made us proud to be Kiwi fans again. Reporter Hayden Jones even used Blam Blam Blam’s version of the Ron Grainer theme tune. Bravo Seven Sharp, and you legend, Mister Lealand! And that’s our people last month. You may not like the stories, you may not like the coat (although I never thought it as bad as others have called it), one thing is clear: Colin Baker enjoyed playing the part immensely. Here was a man who was willing to rub ‘dirt’ on himself, get tied onto a careening cart, and even pop onto an exercise bike. He was also a Doctor of temperament. Okay, it was supposed to be post-regeneration issues, ironed out over an episode or two, but it became a defining characteristic. What it meant was that you couldn’t trust the Doctor from one moment to the next, to see things how we do… he became more alien. In The Trial of a Time Lord, Matrix fabrication or no, what we see on screen could well be the Doctor as himself. This Doctor makes the audience uncertain, edgy, and thus made for better television. And the Doctor loved his words. Many florid speeches, loving correction of the way Peri spoke, and a flourish for the dramatic with his oration. “Nevermore a jumblejack” immediately comes to mind. This also ramped up in The Trial of a Time Lord where, courtesy of Pip and Jane Baker, words went flying like they were cramming whole dictionaries into sentences. What this does show is that the Doctor uses more than action to outwit. Head in a noose? Only afraid he won’t be able to get his point across. At the point of a gun? Never more loquacious. Facing his own mortality? More than once, at that, and yet he continues to think past it (okay, after a bit of a moan). And he had more than enough banter to fend off the Valeyard. 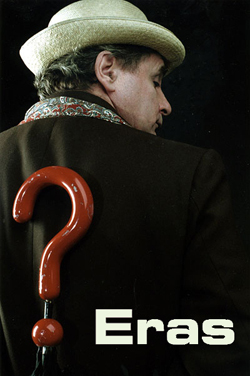 “Old Sixy” (as he now refers to himself) has had quite the renovation post-series, and yet the television stories do show a Sixth Doctor in fine form, ready for whatever call to action comes along. Yeeeeahh, that month. Well, here it is/was! June 2013! The month that Doctor Who Fandom broke? Or was it the month the Anniversary celebrations toppled off their heels down the catwalk steps as the departure of an incumbent Doctor was leak- er, hastily announced? Maybe a bit of both. …but was it also the single-most nail-biting thing to have unfolded over the Anniversary year to date, eclipsing even the official show in its twists and turns? You betcha. Let’s say this now: 2013 has been a stink-fest for actual new, exciting Who-related news. You can keep your stamp sets and minted coins; thirty days (oh, correct my maths, go on!) on from the reality of Smith’s successor disappearing in the fug of bookie charts and Entertainment page sidebars, fake rumours are all we have left. That and well-intended competitions for booty. THE QUESTION THAT MUST NEVER BE ASKED! Heh. Oh, The Book Depository. Well-intended askers of questions for Dr Who booty. How many episodes of Doctor Who were deleted, you ask? Even Richard Molesworth would have difficulty with that one – and said as much! They’ve since changed the competition question, but ho ho, it’s like Who Created the Daleks all over again! Big Finish brings you More Hinchcliffe! This we like the sound of. 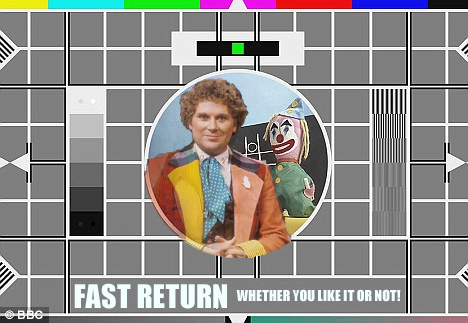 Hell, anything that evokes the Tom Baker of old without comedy Kraals we like the sound of. Look, I said this was old news. Fake Anniversary trailer: Breakdown: Genius! But to play us out instead and fresh from ComicCon, here’s Karen Gillan as a slaphead.